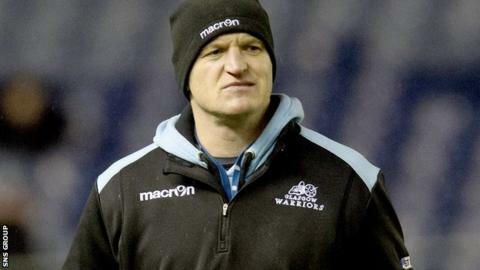 Edinburgh's Alan Solomons believes his Glasgow rival Gregor Townsend can go on to lead Scotland in the future. The coaches go head-to-head over the festive period, with the first of two Pro12 matches at Murrayfield on Sunday. "He's a really good coach and I think that's being recognised now," Solomons said of Townsend. "He certainly has the ability to coach Scotland one day and those decisions will be made by the SRU but he certainly has the ability." Like Solomons, Townsend recently committed to a contract extension until the summer of 2017, having steered the Warriors to their maiden Pro12 title last season. "He was an excellent player and that has helped him too," added Solomons, who has experience as an assistant coach with his native South Africa. "He's an intelligent bloke. "One advantage that Gregor has is that he has played in various parts of the world. He played in France, he played in England and he played in South Africa, so he even has a southern hemisphere influence." Having played one game less, Glasgow are two points above seventh-placed Edinburgh going into the double-header, with the aggregate winners also taking home the 1872 Cup. "These games are massive," said Solomons. "For me, this is one of the big derbies of world rugby." Edinburgh won 20-8 on home soil last season to lift the trophy by a two-point margin but Glasgow - who had enjoyed a five-year stint of dominance before that surprise defeat - are determined to wrestle it back. However, Townsend thinks it will take something special to cut Edinburgh's mean defence open. "Edinburgh are improving all the time," he said. "When we played them last season they were better than the year before. "What they have done this year is really build on what was already a strong defence. They are now the strongest defence in the league and have conceded the fewest tries. "They are aggressive and very hard to break down. They work well together and the way they tackle slows down the ball. "You've got individuals like John Hardie and Hamish Watson who have been in fantastic form too. Add to that, they have a scrum that's also rated the best in our league with the three guys that have been starting in the front-row for Scotland - Al Dickinson, Ross Ford and WP Nel. "We've been working this week on how to break them down and it might be we go away from our traditional game plan and look at other ways to get through them." Townsend insists revenge is not a motivating factor, stressing the chance to impress Scotland head coach Vern Cotter should be the main focus for his players. "Those scenes last year was a good reminder of how much this game means to both teams," he added. "Edinburgh really celebrated their win last year and they deserved it. We will have to play very well to win the trophy back. "A lot of the guys here played in those games and we know we underperformed. We have got to set high standards every game we play but we haven't really spoken about last year. "The timings of the games are good for the supporters - they are even better for the Scotland selectors with the Six Nations just around the corner. "Just a month before we play England they will be able to see how the guys are doing against their direct rivals, to see who is ready to step up."